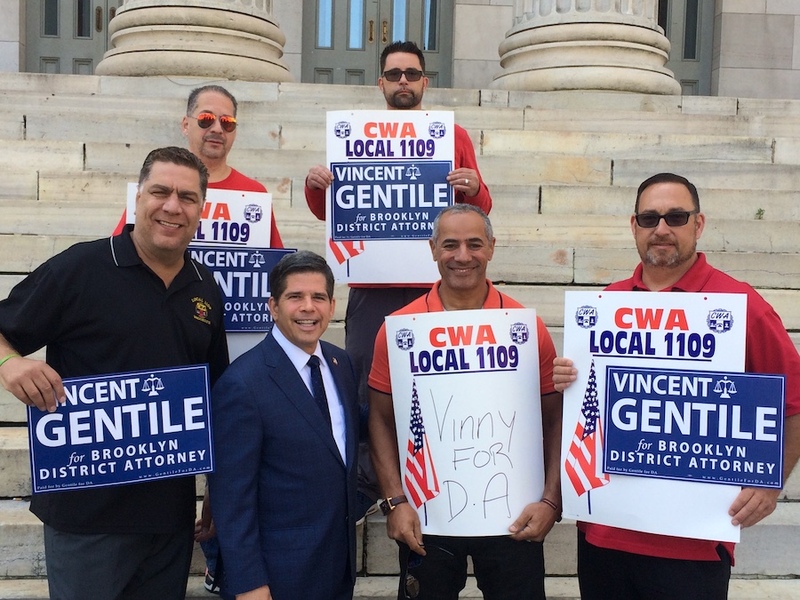 CWA 1109 has endorsed Vincent Gentile for District Attorney in the September 12th Democratic Primary. Gentile has been a friend of labor for many years in the State Senate and for the last 14 years in the City Council. Before he was elected to public office, Gentile worked as an assistant District Attorney in Queens, prosecuting sexual assault and major drug trafficking cases. You can find out more about Gentile and his policies by clicking here. Local 1109 was proud to stand with our brothers and sisters from IUOE Local 94 and Teamsters Uniformed Sanitationmen's Association at a press conference on August 30th to endorse Gentile. Click here to read the article written in the Brooklyn Daily Eagle. 1109 has also made two endorsements for City Council. In District 43 (Bay Ridge, Dyker Heights, Bath Beach and parts of Bensonhurst) we have endorsed Justin Brannan. Justin has a long history of working in the community as well as with labor. Following college, Justin worked as a radio announcer for WNEW and took a leadership role in their union, serving as a shop steward. He then worked for a number of years as Council member, Gentile's Chief of Staff. Our second City Council endorsement is Brian Cunningham, who is running in the 40th District (Prospect Lefferts Gardens, Flatbush, East Flatbush and Ditmas Park). Cunningham is a community activist that has worked in City Hall and as an Aide to President Obama's My Brother's Keeper Initiative, a program that provides mentorship and resources to under-served youth. If you live in Brooklyn, I encourage everyone, who is a registered Democrat, to head to the polls on Tuesday, September 12th and vote for Vincent Gentile for DA and if you live in Districts 40 and 43 please vote for Brian Cunningham or Justin Brannan. As you probably know, the primary in New York City is the main election since the winner of the Democratic Primary is not expected to have a major challenger, so please make sure you head to the polls and vote. If you are unsure of your polling location or party affiliation, you can confirm it by clicking here.